Simple Girl Sweet Mustard is more than just a flavorful, healthy salad dressing. Your clients can also use it as a zero calorie marinade or dipping sauce. Many salad dressings can take the “health” out of a healthy salad since they contain calories, fat, sugar, artificial sweeteners, chemicals, or preservatives. 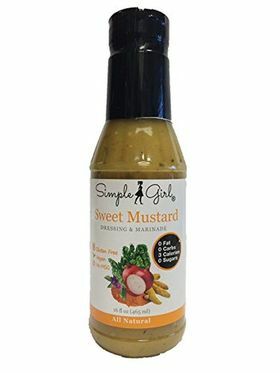 All of the “Simple Girl” (formerly “Perfect Portions”) dressings are perfect for clients who are avoiding sugar, gluten, preservatives, oil, and starches. These dressings are calorie free, fat free, carb free, sweetened only with all-natural stevia and, unlike most sugar free dressings, they actually taste good! This Sweet Mustard Dressing has a sweet taste similar to honey mustard dressing. These all-natural salad dressings are also approved for the HCG Protocol! HCG Dieters can enjoy this HCG diet-safe dressing in unlimited quantities on all phases of the HCG Diet. Filtered water, cider vinegar, mustard (vinegar, water, mustard seed, salt, turmeric, paprika, spice and garlic powder) contains less than 2% of dehydrated garlic, onion powder, salt, organic stevia leaf extract, spices, xanthan gum (provides thickness).